as well as team gold. The Bolivarian Games began in 1938, but has only featured dressage since 1985. In the individual events, Colombia’s Diana Elizabeth Rey and Radme Mahamud won the gold and silver medals for Colombia and led their team to the top spot with 199.162 points. Peru received the silver with 187.054 points and Ecuador was awarded bronze with 187.054 points. The individual bronze went to Guatemala’s Margarita Cebeira and Quanderus. 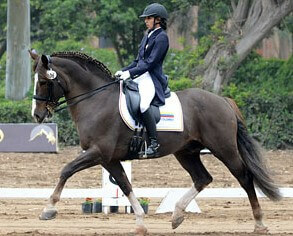 Colombia’s Diana Rey and Celina won the team and individual test with 68.189 percent and 68.542 percent. Rey has been riding Celina since 2008 and are trained by Colombian born American Cesar Parra at his stables and at clinics hosted in Colombia. Rey is also working with German Grand Prix rider Ulla Salzgeber, who is the current Colombian national coach. 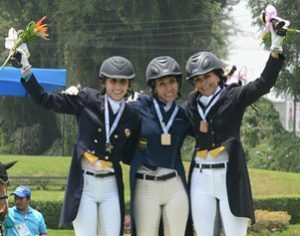 Part of the gold medal winning Colombian team, Radme Mahamud won the silver medal in the individual test after having only been with Highlander for just over a year. Highlander was bred and is owned by trainer Raul Corchuelo who is also their trainer. ment for the 48-year old Margarita. 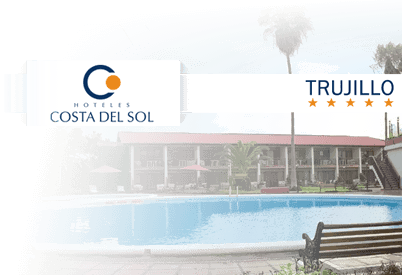 Margarita is trained by Juan Andres Rodriguez and has been riding Quanderus since 2012. Mexican 5-star judge and former IDOC representative of Latin and South America, Maribel Alonso was amazed at both the high level of dressage skill at the Bolivarian Games. Alonso was disappointed that only fifteen horses were entered into competition. Of the eleven countries represented at the 2013 Bolivarian Games only six competed in the dressage event: Peru, Colombia, Ecuador, Bolivia, Venezuela and Guatemala. Challenges with transport and bureaucracy were the two major issues for participants. One of the Bolivian horses had to be retired as it wasn’t in fit condition to participate after land travel of almost a week. Sanitary conditions remain a major issue in every country and competition, which increases the burden of long distance travel. Alonso believes a solution can be found through the national dressage groups creating a protocol to make travel of sport horses between countries easier and expeditious. 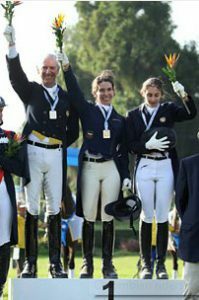 In addition, at the 2013 Bolivarian Games, the tight schedule caused by local elections in Peru, meant that judges and staff were shared between dressage and eventing. This lead to small audiences and disappointment for the riders in competition and those unable to cheer them on. It is hoped the next Bolivarian Games, to be held in Santa Marta, Colombia in 2017, will include more participants from more nations. Copyright © 2019 2013 Bolivarian Games. All Rights Reserved.